TASMANIA doesn't have its own AFL team but the Apple Isle will almost certainly provide the Coleman medallist, with Tassie ex-pats Ben Brown and Jack Riewoldt to fight it out over the final fortnight of the regular season. 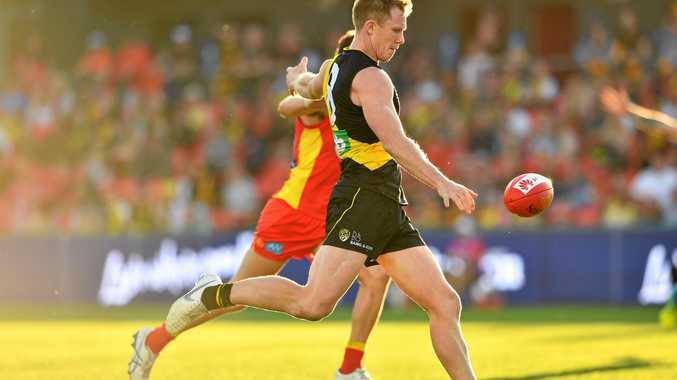 Riewoldt opened the round a $17 long shot with betting agency Ladbrokes but, such is the nature of the season, a 10-goal haul against the Gold Coast had thrust him into the lead by Saturday night. 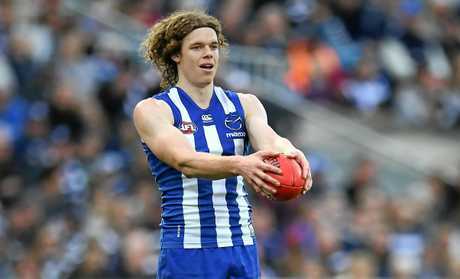 Brown managed to square things up with four goals in the Kangaroos' loss to the Bulldogs but he has drifted in the market off the back of the Riewoldt charge. The Kangaroos star is $1.40 out to $1.85 but holds a narrow lead in the Ladbrokes market with Riewoldt at $1.95 while Swans superstar Lance Franklin appears out of it. "Buddy is six goals off the pace and at $17 and, if it wasn't Buddy you would just about say it is a race in two," Ladbrokes spokesman Roger Oldridge said. "It's been a season of wild fluctuations in so many of the futures markets, I dare say we will see some money come for the Swans superstar this week at that price." On the subject of wild fluctuations, with the exception of Richmond ($2.30), GWS and West Coast (both $7), there was more chopping and changing in the premiership market after the weekend results. Hawthorn is the big mover as they edge closer to a top-four finish, in from $21 to $11, while Sydney did a you-turn on their recent drift, firming from $21 to $13. Port Adelaide were the biggest losers in the eyes of bookmakers, with West Coast's Jeremy McGovern's after-the-siren goal costing them four points and seeing their premiership price wound out from $15 to $34. Melbourne ($8 out to $15) and Geelong ($13 out to $17) also did their chances of lifting September silverware serious harm according to Ladbrokes bookies. "With the couple of exceptions, most notably Richmond, the season is so close these prices are every chance to flip next Monday so, clearly, if you think you're getting overs, get on," Oldridge said.